Winter has ended in the north of India, the only part of the country which has a clear winter. That is the season when gardens are full of exotic flowers brought from temperate countries. Bees are everywhere at the end of winter, in the last flowering of gardens, and continuing into spring, the season of wildflowers. On my trip to Dehradun, and up to the Garhwal Sivaliks, I saw lots of flowering gardens. I didn’t manage to capture the bees with my phone camera, but I got the flowers. Still through the ivy flits the bee. the leaves are touched with brown. March is the cruellest month in the mountains. 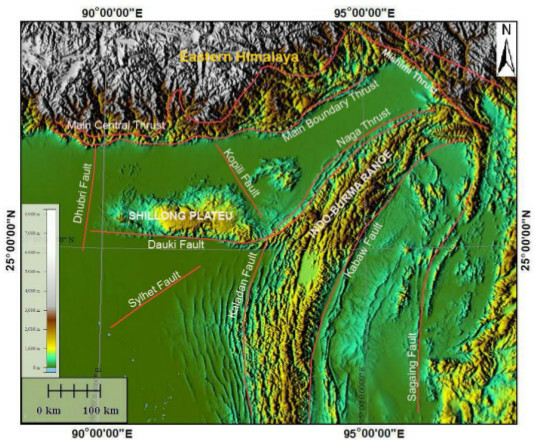 We often go for a short holiday to the Himalayas in March. The roads are usually open, but the weather is unpredictable. 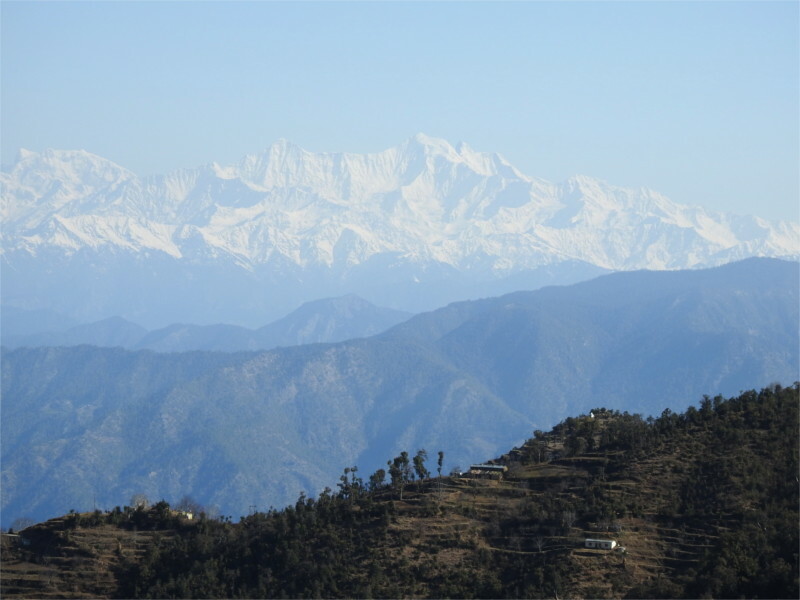 We found a hotel in the Garhwal Sivaliks where we were the only guests, and our room had a spectacular view. Our last day there had been clear (photo below) but clouds began to come in over the high peaks just before sunset. Sunset and sunrise paint the snow in glorious colours. 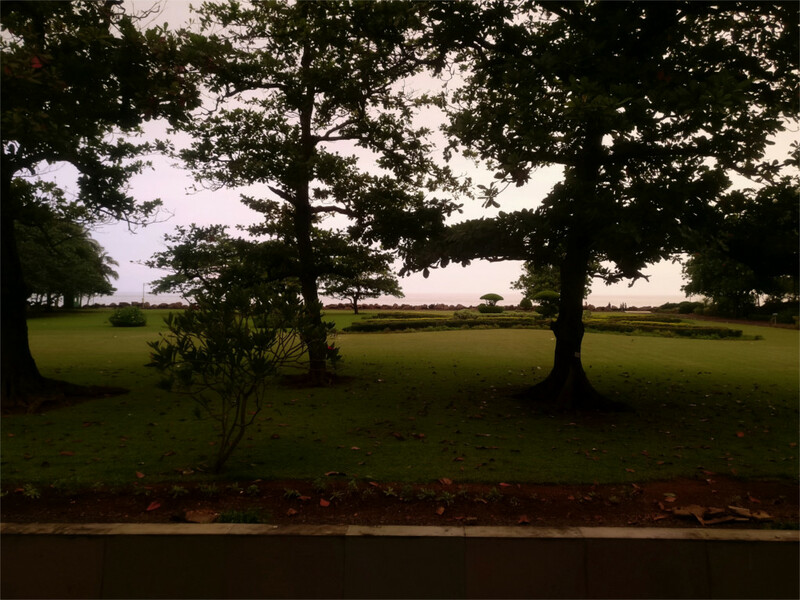 The clouds muddied the colours. Dawn had been even more cloudy, but it had cleared up soon after sunrise. During breakfast we kept our eyes on the clear view of the mountains. The day was great and the view was wonderful. 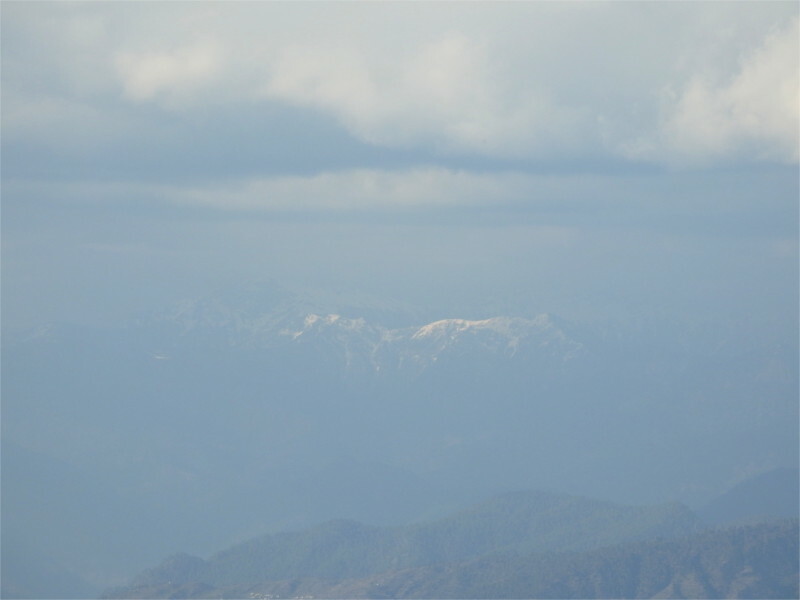 We decided to travel along a route which would keep the high Himalayas in our view most of the time. This was a day when our luck held, until sunset. March is cruel. The weather keeps changing, and predictions are not accurate more than a day in advance. When we arrived at the hotel the view we had was spectacular for a photographer (above) but disappointing for a traveler. Every year we keep telling ourselves “Next year we’ll come to the Himalayas in April.” Maybe next year we will. Evening was falling when we reached Nohkalikai waterfall five years ago. Thick clouds had descended over the waterfall. When we walked up to it all we could hear was the thunder of water in India’s tallest waterfall. The 340 meter drop would have been a wonderful sight, but the sound was impressive enough. 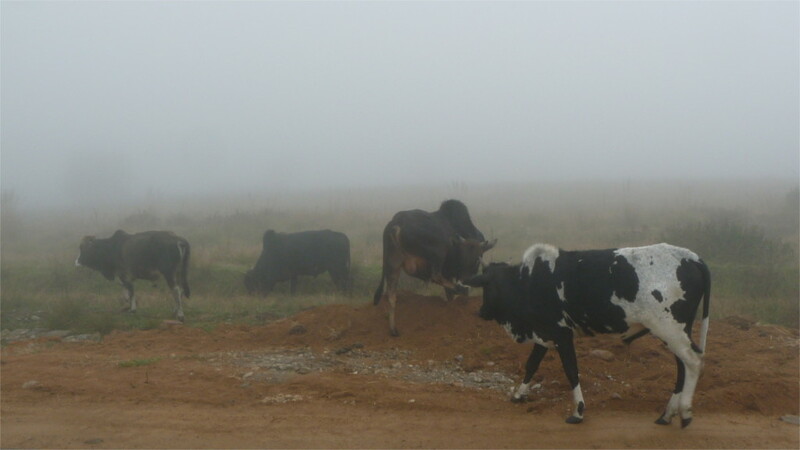 We had tea in a stall nearby and waited for the fog to lift. I kept my hand in by taking photos of a work gang tarring the road. Later I would read the tragic legend of Likai, gory enough to rival Shakespeare’s Titus Andronicus. 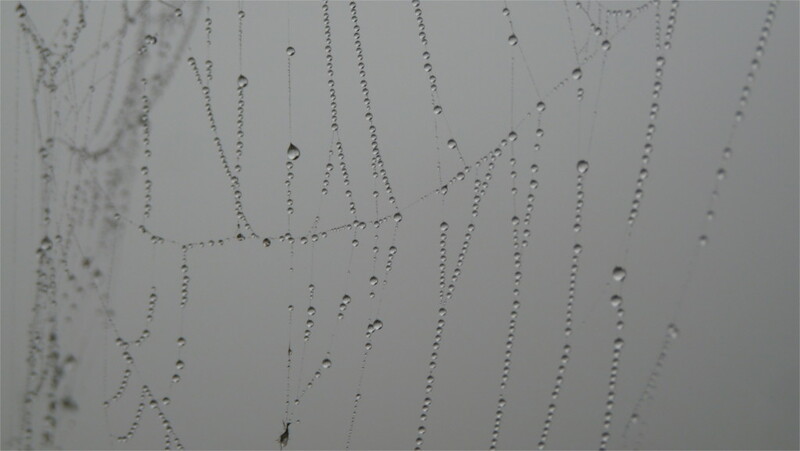 The fog did not lift, and we never managed to go back. Sometimes the journey is all you have. 10 degrees North. 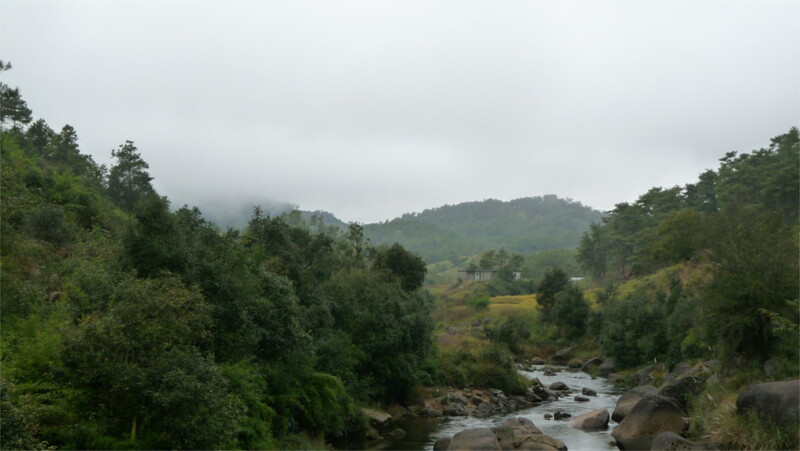 Anachal, Kerala. 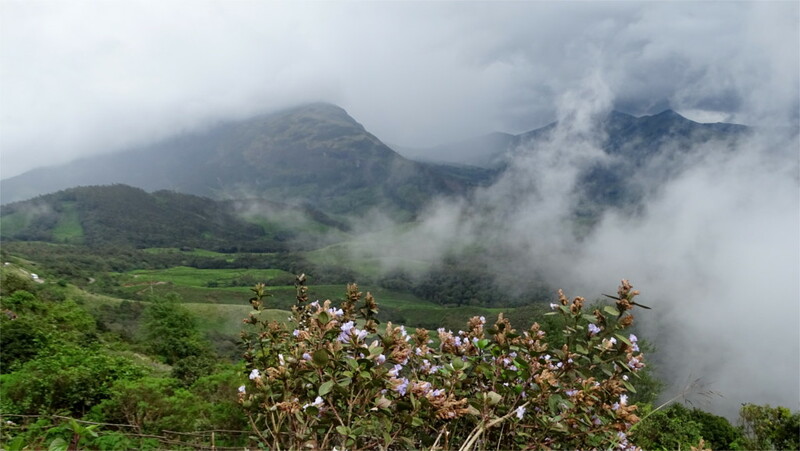 The weekend that we spent in Madurai was originally set aside to visit Munnar to watch the rare flowering of Neelakurinji (Strobilanthes kunthianus). Over dinner with old friends we talked about having to cancel the trip to Munnar because of the monsoon flooding of Kerala. 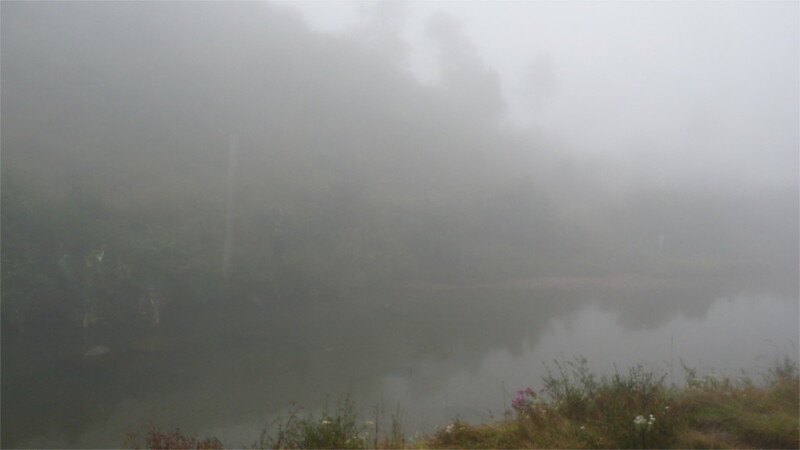 One of them suggested that we go to Munnar that weekend since the flood waters had drained away. The Neelakurinji flowers once in twelve years, so this was an attractive proposition. All six of us agreed to take the Friday afternoon off, so that we could fly to Kochi in the evening and drive to Munnar the next morning. As the designated “naturalist”, I had to brush up on my knowledge of the phenomenon. 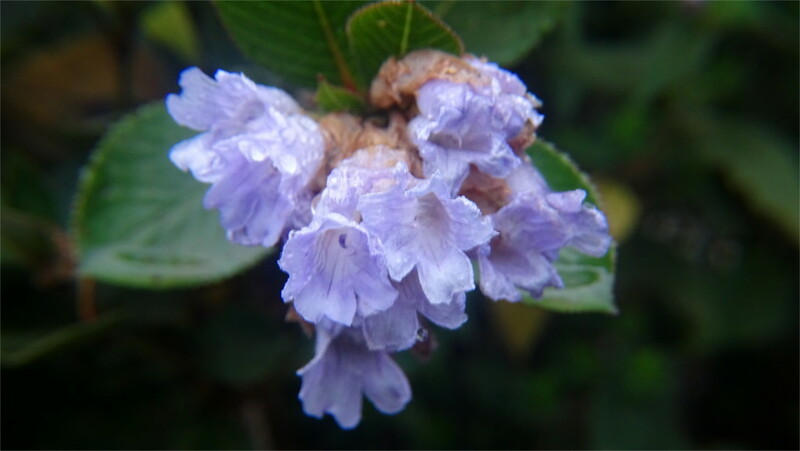 The Neelakurinji is a grassland flower, as media photos of meadows covered with purple flowers show. But these photos came from earlier flowerings. I was not sure how much damage had been done by this year’s record rain. The genus Strobilanthes has several species which have mast seeding: meaning all bushes flower in synchrony after many years. The Karvi (Strobilanthes callosa) flowered in 2016 and will flower again in 2024. The Strobilanthes agasthyamalana is said to flower once in 16 years. Plants which flower so seldom have to make sure that each flower stands a very high chance of pollination. A study of the 2006 flowering found that the flower was sculptured to increase this efficiency. The mass flowering attracts the Indian honeybee in large numbers (look out for neelakurinji honey later this year). In unfertilized flowers, the receptive surface of the stigma faces the entry path of the bee, and moves away when the bee exits, and the flower remains fresh and produces large amounts of nectar for two days. From the mid-19th century CE there were reports that jungle fowl migrated to flowering meadows to eat the seeds of the plants. This mass migration has not been observed after the removal of forests in the Munnar area. When we arrived in Eravikulam National Park, the sky was overcast, and the sun, already low near the horizon, was beginning to look decidedly tired of keeping us in light. There were a few flowering bushes, but nothing like the photos and videos which the media were displaying, without telling viewers that they were shot in 2006. The honeybees are most active just before noon, so we didn’t see them at work. It had rained hard since the middle of week, and the rain set in again while we were in the park. 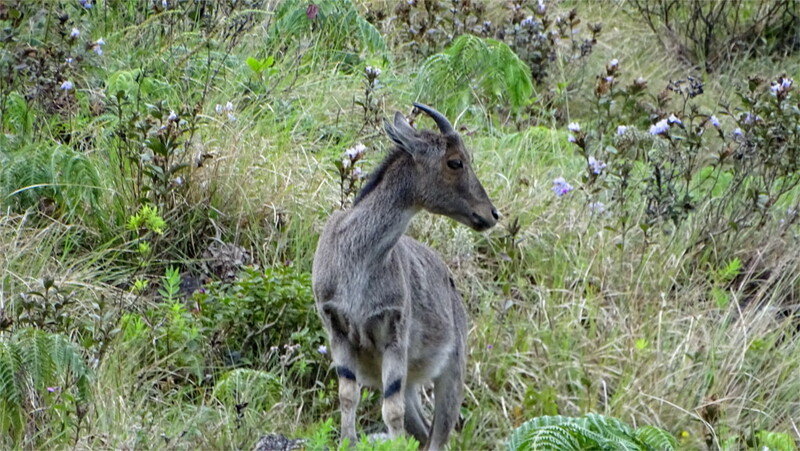 We had a sighting of the Nilgiri tahr in a meadow dotted with Neelakurinji. It seemed to avoid the Neelakurinji as it browsed. I wonder whether there are toxins which the plant secretes. From the point of view of a tourist spectacle, this was a disappointment. As a budding wildflower enthusiast (bad pun, I know) I was happy to have seen this plant which one has so little chance of seeing, since it dies after flowering. I had a good time with my macro lens peering into the two meter high bushes where this flower grows. We later found that there is only one more spot near Munnar where the flowers were visible this year. 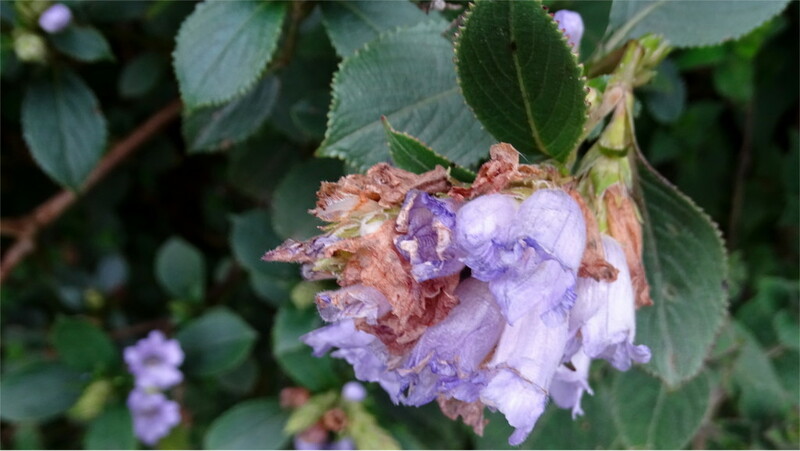 Because of the extreme rain in August, few bushes flowered, and because of the renewed late rain in September, many flowers were not pollinated. I wonder whether this is a crisis for the species. I guess we will know by 2030, when it is next supposed to flower. For a few evenings there was a beautiful yellow light which would bathe the world around us after sunset. As the red glow on the clouds faded, moments before it turned dark, the world would become a magical yellow. If you mentioned this to someone on the streets of Mumbai, they would smile and agree. The featured photo was taken quite a while after sunset; you can see that the camera, while trying to compensate for the light, makes a blur of the birds. This is not a light we see every year. After the monsoon the skies are generally clear of dust. If there is the normal pollution of the city, it just creates a haze and reddens the sunset. This colour came with a clear view of the horizon. It wasn’t even as humid as it could have been. It was a mystery until people started mentioning a raging fire on Butcher Island, off the coast. The fuel that is stored for ships on this outer island had caught fire and it took days to bring the blaze under control. Light effects at sunrise and sunset depend so much on what the air contains. Moisture, dust and smoke are all things that produced beautiful sunsets. What was this due to?